Aidan Fisher was born near Bath . He studied composition, viola and conducting at the Royal College of Music. He was then appointed Composer - in - Residence at Charterhouse School, with funds from the Ralph Vaughan Williams Trust. 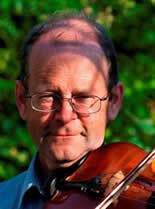 In 1985 he was working in London as a freelance viola player, teacher (with The East London Late Starters Orchestra) and also as a composer. He moved to Dorset in 1991, where he now teaches. He plays viola professionally with many local ensembles most notably with the Bournemouth Symphony Orchestra as an extra player.